Is Content Still King or Has Context Claimed the Throne? ken the message to heart; according to one source, enough content is produced during every 48-hour period to equal all of the content produced since the dawn of time. Wading through the sea of available content is a bit like thumbing through a 500-page novel to locate a single line that you vaguely remember but want to quote in its entirety. Most of what you are reading is so irrelevant to your current mission that you become annoyed and frustrated — much like your customers if you present them with a mountain of content that is not relevant to their current needs. Your content may be of the highest quality and deserving of multiple literary awards, but if no one wants to read it, it might as well not exist. Content that is devoid of context is little more than a collection of words occupying valuable space. Context without content is just a blank page. However, when quality content is delivered within the proper context, the results can exceed your expectations. 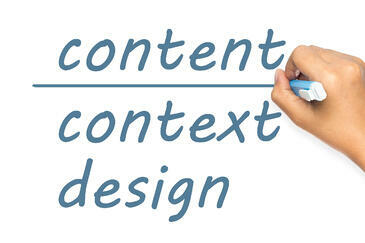 Context enables you to deliver the right content to the proper audience at the right time. To illustrate why this matters, consider the following examples and how you would react if you encountered them. Your town has received 10 inches of snow in the last 24 hours, and the snowfall is expected to continue throughout the day. You search for nearby restaurants, hoping to find one that offers a delivery service. The top search result takes you to a page enthusiastically promoting the restaurant's open-air patio. The second restaurant's page features a banner proclaiming, "We deliver in all kinds of weather." Which restaurant has provided content that is meaningful and relevant to your needs? Your oven goes out the day before Thanksgiving. When you search for a repair service offering quick response, you get articles on remodeling your kitchen on a budget, a comparison of gas and electric ranges, recipes for oven-baked chicken and an ad offering to buy non-working appliances. At a time when you are already feeling a bit stressed, would you consider having to wade through all of the irrelevant content annoying? Every piece of content shown in the examples is relevant to someone at some point. However, it is delivered without regard to context, which makes it irrelevant to you. Your memories of the companies providing with the search-engine equivalent of junk mail will likely last much longer than your current need. To gain true value from your content, you must ensure that your content provides something of value. The only way that you can ensure that you are creating value is to offer content that has value in the current context. Know your customers as well as the platforms that they use. For example, a middle-aged man has a different mindset when on Facebook than a 30-year-old woman has on Pinterest. Knowing what will appeal to each type of customer helps, but you must also understand their motivations for using the different platforms. Provide content that offers a solution to a real-world problem. Identify a problem that your product can solve, but instead of focusing on the features of your product, offer realistic ways that your product can solve the reader's specific issue. Do not try to develop one-size-fits-all content. Develop content that focuses on different audiences or solves different problems. Mine your data to create personalized content that is delivered in the proper context. Engage your customers. Social media sites are excellent opportunities for getting to know your customers, but if you are providing content without context, you could be hurting your brand. Remember that social media users typically want to be entertained, inspired or receive information that is useful to them. They do not want to read your sales pitch. Respect your customers' time. Do not make them wait until the last 10 seconds of a 10-minute video to find the answer to their question. Do not make them lose their place when reading an article by using pop-ups asking them to subscribe to your newsletter that send them back to the top of the article when they close them. Most importantly, never use a bait-and-switch technique to make them think that your content is contextually relevant when it is not. Providing content in the proper context helps establish you as a useful, credible authority. It is more about building the customer's trust and establishing a long-term relationship than it is about an immediate conversion. Providing content without context can lead to the perception that you are clinging to outdated methods and have little respect for your customers. In short, content and context have become co-rulers of the marketing world.